Thank you for being the very best of all the holiday candies. I mean, let’s face it; there really is no holiday that comes close in terms of manufactured sweet treats. Christmas candy canes ain’t got nothing on you. Valentine’s Day conversation hearts? Meh, they’re cute and all, but I could live without. You would think Halloween would have the best candy of all; after all, it is an entire holiday based around candy. But besides candy corn (which is likely to make you ill the second you eat one too many, which is every single time), Halloween candy is really just your typical every day candy. But Easter? You’ve got all the good stuff. Cadbury Eggs (the regular sized ones AND the mini ones) and Peeps. Easter candy is SO good, they’ve tried recreating Cadbury Eggs and Peeps for other holidays. But they’ll only ever be Easter candy to me. Easter candy, you win. 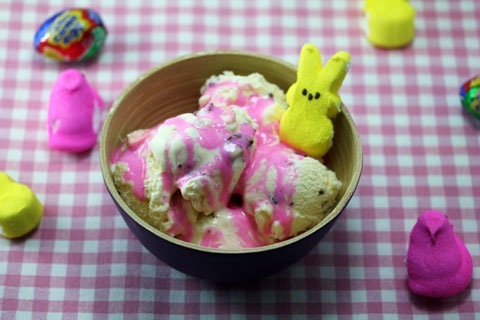 And now I think I might win by mixing the two best Easter candies with ice cream and creating Cadbury Creme Egg Ice Cream with Peeps Syrup. The only thing that could make this better would be jelly beans. But I feared that may be going overboard. Jelly bean ice cream? That might be a whole different ballgame that needs to be attempted. Best holiday candies ever! And no, there is nothing healthy about this ice cream. Thank you for inquiring. But luckily, this is a super duper easy ice cream. 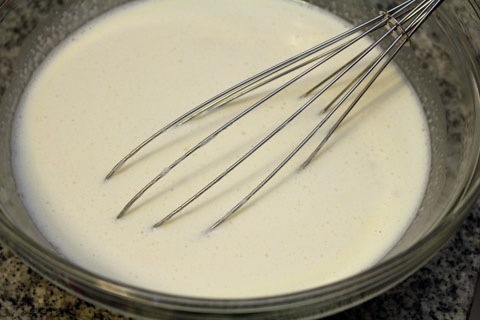 Now, pour the heavy whipping cream, milk, and vanilla into the bowl with the eggs and whisk everything together. Cover this mixture with plastic wrap and chill for about 4 hours, or overnight if you want to. 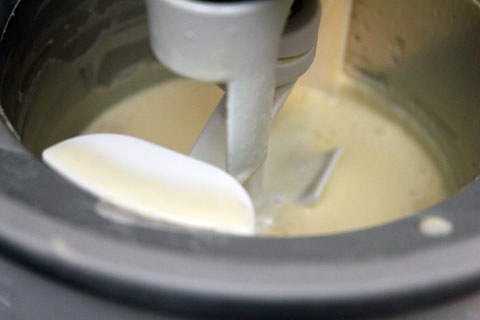 When the mixture is nicely chilled, pour into an ice cream maker and follow manufacturer’s direction. 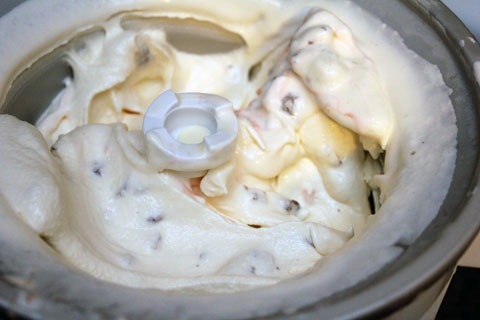 While the ice cream is churning, chop up your Cadbury Creme Eggs. Try not to eat too many of them. It will be tough. But you can do it. When the ice cream is close to being finished, mix the Cadbury Eggs in. 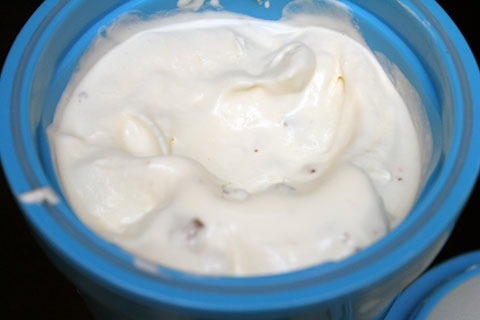 Store the ice cream in a airtight container and freeze for at least 3 hours or overnight, until the ice cream hardens. 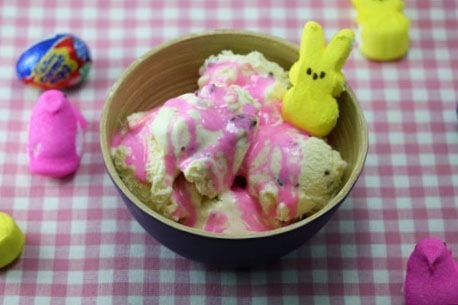 When you’re ready to serve your ice cream, you’ll definitely want some Peeps syrup on top, right? Right. This was an experiment on my part. 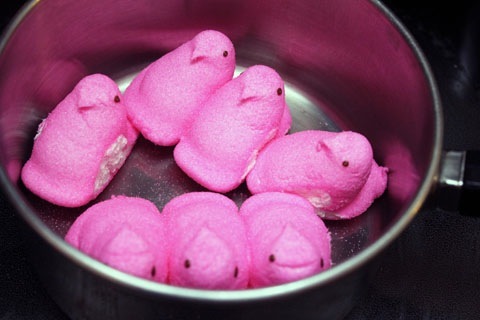 I put 7 Peeps in a small saucepan and turned the heat to medium-low. And waited. And waited some more. Nothing happened. The Peeps did appear to be getting a bit fatter and I wondered if they would simply explode like they do when you put them in the microwave. Not that I do that. So, I added a tablespoon of water. And bam! Instantly the Peeps started bubbling. Check out this sad scene. I stirred for a couple minutes and was rewarded with Peeps syrup. Simple as that! You’re ready to enjoy! 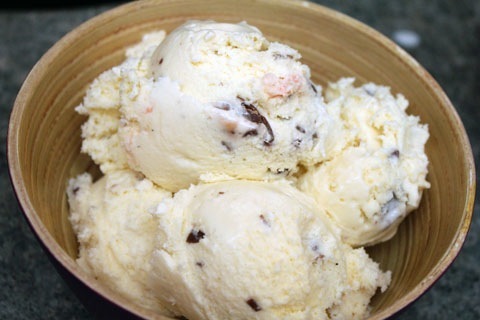 Serve a bowl of Cadbury Egg Ice Cream. And then pour some Peeps syrup over the top. You can add an extra Peep on top for good measure if you want. I did. Talk about a festive ice cream! The base was delicious and vanilla-y and the amount Cadbury Egg treats hidden inside was perfect. I obviously dug around my bowl of ice cream with my spoon to get all the good pieces out. 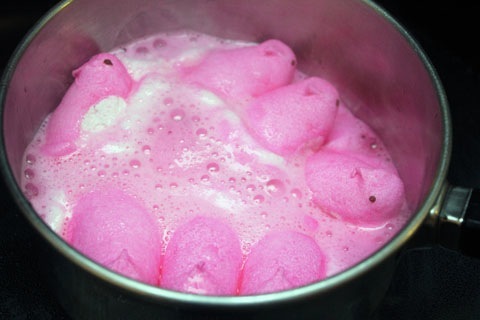 If you were having a group of people over for Easter, I think it would be fun to make a few different colors of Peeps syrup and give each person a different one. It’s so pretty! 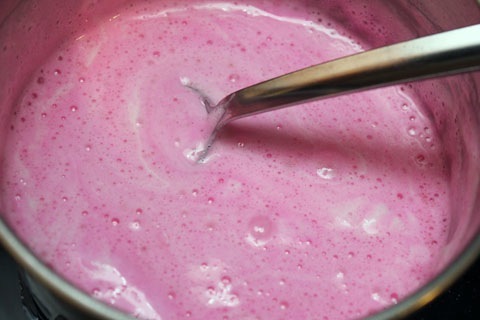 (yes, it’s really just artificially colored marshmallow fluff, but I don’t care). 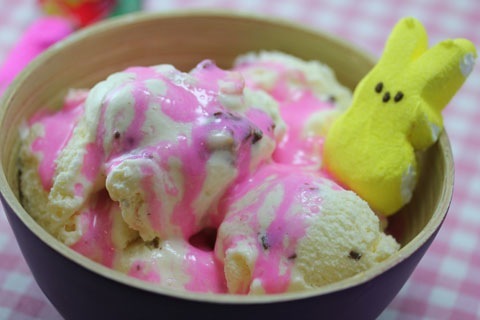 That yellow Peep does look a bit sad to be sitting on top of his melted friends. But he got over it. Because I ate him, too. And it was delicious. For everyone who doesn’t like Peeps, I do not understand. Marshmallows covered in sugar? I have no words. Oh, Easter candy; I thank you for your bountiful delights. I’ll miss you when you’re gone. And you know what the saddest part is about Easter almost being over? The next good candy holiday isn’t for an entire 7 months in October. Why do they do that?? 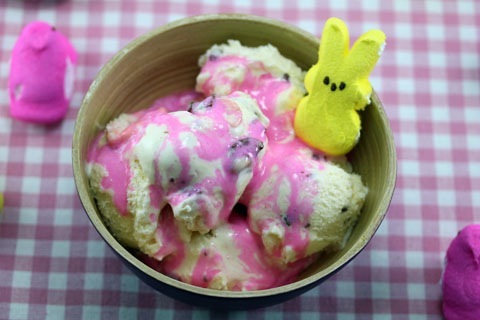 30 Responses to "Cadbury Creme Egg Ice Cream with Peeps Syrup"
Easter candy is my all time fav! Between the cadbury eggs and the min i eggs… I die! Um… I want to marry this. 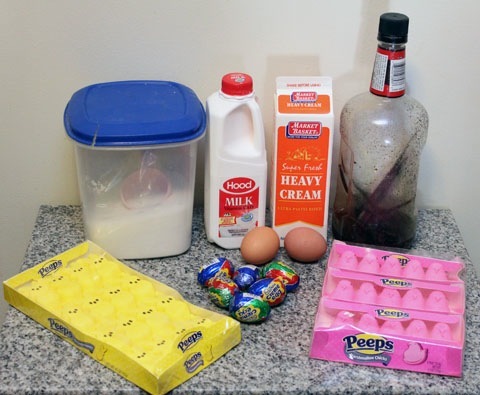 I want to make sweet Cadbury Creme Egg/Peep babies with it. It looks AMAZING. Oh no! That picture with the peeps melting is the saddest thing I’ve ever seen. Poor peeps. Looks like at least they were put to a yummy use. omg what a bowl of easter goodness!! 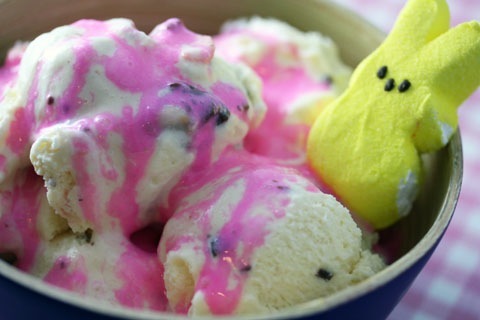 I am pretty obsessed with peeps (and strangely like them ever so slightly stale) — melting them is such a good call! You don’t cook the egg mixture? @Erin- Nope. 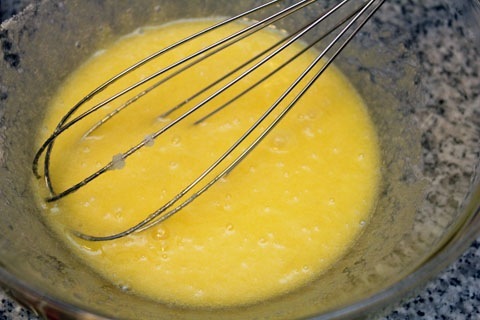 I’ve made A LOT of ice creams and, in my opinion, the best are with raw eggs. This ice cream base is a variation of a Ben and Jerry recipe and they use raw eggs in all their recipes. When I’m making ice cream, I make sure to buy the freshest organic eggs I can… It’s definitely a preference thing, but fresh 2 eggs in a quart of ice cream doesn’t worry me. 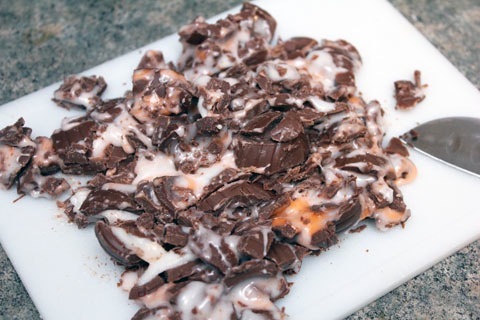 But I totally get if you don’t want to try it, so then I recommend either using an eggless or custard-based vanilla ice cream and adding the Cadbury Eggs when it’s processing. I hope that helps! Those poor Peeps! Just looking at this is giving me a sugar high. 🙂 Easter candy is amazing. I love Cadbury mini eggs. 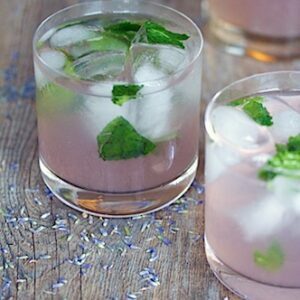 This sounds so decedent and looks so pretty with all the pinks and other Easter colors! This is genius!! I love the Cadbury chocolate eggs…the mini ones with the crunchy candy shell. I can’t remember what they’re called, but we have a bag of the dark chocolate ones in our pantry that I’m trying to hold back from opening too soon! chocolate malted milk pastel shell eggs and jelly belly sour mix beans dove bar bunnies, and of course, I get peeps every year. but seriously, that dessert is over the top. I’m going to soften some store-bought ice cream and mix the chopped Cadbury Eggs into that. It will be a passable substitute, though not nearly as good. How about some chopped jelly beans sprinkled on top? FYI…..Hershey is bringing the Cadbury Creme Eggs back at Halloween this coming year. They are called Screaming Eggs, and the creme filling will be a Neon green color! The melting peeps look so sad! We need to make more before Easter. It just makes sense… right!? 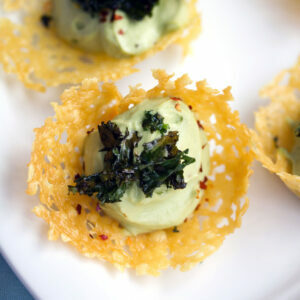 I’m from Spain and I follow your blog and recipes… I love them!!! You have to say 7 things about yourself and give the flowers and the prize “your style” to 15 blogs that you follow. 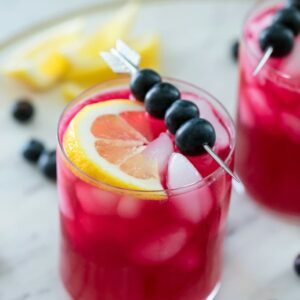 Absolutley loved this recipe. I’ve been eating peeps since I was 2 years old and nothing compares. I don’t really think there are any true food ingredients in them — all chemicals but man they taste good. Also love the Cadbury eggs. I still rremember when they first came out and they were twice the size. What a great idea, although it’s kind of sad seeing those peeps melting, lol. I haven’t made any ice cream yet this year, so I think I need to make this asap! My favorite Easter candy is a tie between the mini creme eggs and the mini eggs with the hard shells. I agree with you, Easter has the best candy! Aww, poor peeps, lol. What a super creative Easter treat! Ummm…yum. This could be a serious peeps problem. For my belly. So am I missing something or is the egg raw in the finished icecream? 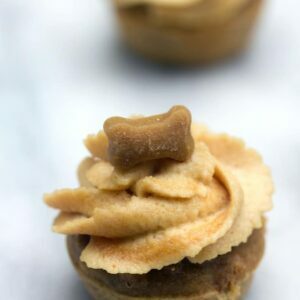 These are my all time two fav treats, cant wait to try it! @Tami- Yes, it’s raw egg. Here’s my spiel 🙂 I’ve made A LOT of ice creams and, in my opinion, the best are with raw eggs. This ice cream base is a variation of a Ben and Jerry recipe and they use raw eggs in all their recipes. When I’m making ice cream, I make sure to buy the freshest organic eggs I can… It’s definitely a preference thing, but fresh 2 eggs in a quart of ice cream doesn’t worry me. 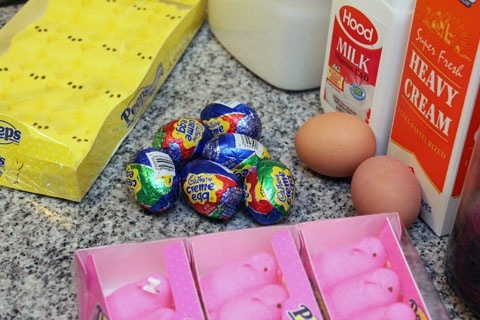 But I totally get if you don’t want to try it, so then I recommend either using an eggless or custard-based vanilla ice cream and adding the Cadbury Eggs when it’s processing. I hope that helps!